Who would have thought that in the year of Occupy protests and anti-fat-cat rhetoric that Seattle’s agenda would be hijacked by a multimillionaire San Francisco hedge fund manager? But so it was. An unknown guy named Chris Hansen spun the civic debate by proposing to invest around a half-billion dollars in building a new basketball/hockey arena in SoDo. What did that portend? For one thing, a salving of the civic wound left by the 2008 departure of the Sonics to Oklahoma City. While the city faced ongoing debates over schools, police and transportation, Hansen’s proposal added something fun to the mix, a possible win-win deal that would boost the pro-sports scene and give us all something to cheer about. The new twist: It would cost the taxpayers maybe $200 million, and the city and county might even walk away with a profit. — K.B. Six years ago, CEO Christian Chabot predicted that Tableau Software would be Seattle’s next billion-dollar company. For eight years, Tableau has helped clients see the big picture with software that organizes data graphically, becoming one of the standard productivity tools across the industry spectrum. After scoring eight consecutive years of record sales and explosive growth, Tableau is expected by many analysts to go public sometime next year, which likely would make Chabot’s billion-dollar prediction come true. — J.L. 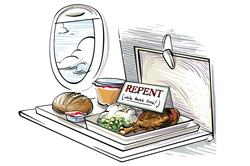 After 30 years of making first-time fliers wonder why there was a need for a prayer card on an airplane, Alaska Airlines this year finally suspended the practice of including Old Testament psalms with its in-flight meals in the first class cabin. While some, like former Alaska Governor Sarah Palin, criticized the decision, others said they never liked the cards. Frequent flier (and Starbucks cofounder) Gordon Bowker told The Seattle Times the cards made him nervous because “they must be worried that something bad was going to happen. [And] if they’re worried, I’m worried.” Other anxious customers were puzzled because they didn’t know if it meant they should pray to survive the flight or the meal. (The cards were distributed with meals only in first class because the airline stopped serving meals in coach six years ago.) — D.V. Bellevue-based startup Zip Zester LLC won a Kitchen Innovations Award at the 2012 National Restaurant Association Show for its Spin Zester, a clever device that can zest a lemon or lime in less than 12 seconds. It’s a little spendy ($230) for home use, but founder Ben Willis expects chefs and bartenders to make it a must-have item at restaurants, bakeries and distilleries. — L.H. The 50th anniversary of the Seattle World’s Fair dominated the milestone-marking calendar for the better part of the year, so you may have missed these other observable occasions in 2012. — S.H. Jim Albaugh stepped down five months ago as president and CEO of Boeing Commercial Airplanes, but not before brokering a deal that will have enormous impact on the local economy. The agreement between Boeing and its machinists union ensuring that the 737 MAX will be built in Renton is a “tsunami-sized deal,” according to U.S. Senator Maria Cantwell. By all accounts, Albaugh set a new tone of peace during the negotiations. The first of the new-generation MAX jets are set to roll off the line sometime in 2017. Boeing already has more than 1,000 orders for the plane, the workhorse of the commercial aviation business (see page 14). — K.R. To understand the impact of Cliff Kushler, the inventor of Swype software, look no farther than your smartphone. If you’re like many users, you’re often frustrated by the tedious “keyboard” that transforms texts into gibberish. Enter Swype, a touch-screen technology that lets you “type” by connecting the dots between the letters in a word without lifting your finger from the screen. The new technology is garnering high praise for enabling fast, accurate texts; it rolled out this year on certain Android phones. — K.R. True, it posted a loss of $274 million for the third quarter. But make no mistake: Amazon’s enormous impact on Seattle is going to be felt for a long, long time. Ironically, a Seattle Times series on Amazon last year poked the company for not having much of a civic presence. The Times was referring mostly to the company’s charitable involvement, but when a business of 65,000 employees is hiring at the pace of dozens of people a day, and is responsible for filling 1.8 million square feet of office space across 11 buildings in South Lake Union, with plans to occupy 1 million square feet more in a three-building headquarters campus downtown, well, it’s enough to make Bigfoot envious. Amazon has the clout to materially affect Seattle — from transportation to retail services to real estate prices — for decades. Not since Boeing was the only game in town has a company created such a physical impact in the heart of Seattle. — J.L. It’s not as if Microsoft is betting the company on the Surface tablet and its ability to make the new Windows 8 operating system a huge hit. It just seems that way because Microsoft really could use a winner right about now. And the Surface, a light (but not lightweight), touch-friendly, sturdy little computer is the company’s best entry into the gadget field in a while, and Windows 8 is the next-generation operating system that’s a bit of a departure from good old Windows. Will they make people less likely to buy iPads and Kindle Fires? Perhaps. Perhaps not. More to the point is whether they make Microsoft a bona fide player in the tablet market and, by extension, the wider consumer products sector. — J.L. Here are the best performing stocks in the Seattle Business magazine Washington 60 Index, ranked by total return from year-end 2011 to October 22, 2012. * Market capitalization (total valued of issued shares) in millions. ** Share price as of October 22, 2012. *** Percentage change from year end 2011. The past year brought an explosion of local smartphone apps to help you save time, money—perhaps even your marriage! John Cook and Todd Bishop of GeekWire rounded up their favorite new local apps of 2012. Say farewell to PowerPoint! Haiku Deck aims to help you create beautiful slide decks, with features such as the ability to find Creative Commons images that suit the subject of your presentation. No endless bullet points allowed; this app helps you keep it simple. Developed by South Lake Union¬-based Giant Thinkwell, Haiku Deck debuted on the iPad this fall. Files can be exported to be used in Apple’s Keynote and, yes, Microsoft PowerPoint. Free, with in-app purchases for additional effects. For iPad (but viewable via email on any device with a browser). Hate junk mail? So do we. PaperKarma acts as a virtual paper shredder for that annoying junk mail that fills up your mailbox. Developed by Seattle software developers Brendan Ribera and Sean Mortazavi, this app lets smartphone users snap a photo of a physical piece of junk mail and immediately be unsubscribed from the distributor’s list. Free. For Android, iPhone, iPad and Windows Phone. Shopping for consumer electronics can be a pain. So many choices, so many price fluctuations. Developed by the same folks who brought the world the Farecast airfare prediction technology, Lower Queen Anne-based Decide lets you compare prices on laptops, digital cameras, tablets, televisions, refrigerators and more than 500,000 other products. Best of all for budget-conscious shoppers: Decide will tell you, while you’re standing in front of that TV or laptop at the store, whether there’s a more affordable model at a nearby store or online. Free. For iPad and iPhone (Android version coming in 2013). Perfect for those who are chronically late or family members who want to keep tabs on one another, Glympse allows users to share their locations in real time. Designed by ex-Microsofties Bryan Trussel and Steve Miller (located in South Lake Union), Glympse takes the creepiness out of location sharing by allowing users to choose whom they share their location with and when. Next time you’re running late, send a Glympse and your friends or coworkers will be able to track your whereabouts. Free. For Android, BlackBerry, iPhone and Windows Phone. SUPERLATIVES > We’re No. 1 (through 10)! It has become pretty routine for Seattle and Washington state to make somebody’s Top 10 List. So routine that it’s easy to forget how frequently it happens. Here’s a refresher list featuring 20 “top 10” mentions from the past year alone, most of them centering on economic issues. — S.H., J.L.